I had an extra special treat for my birthday this year. 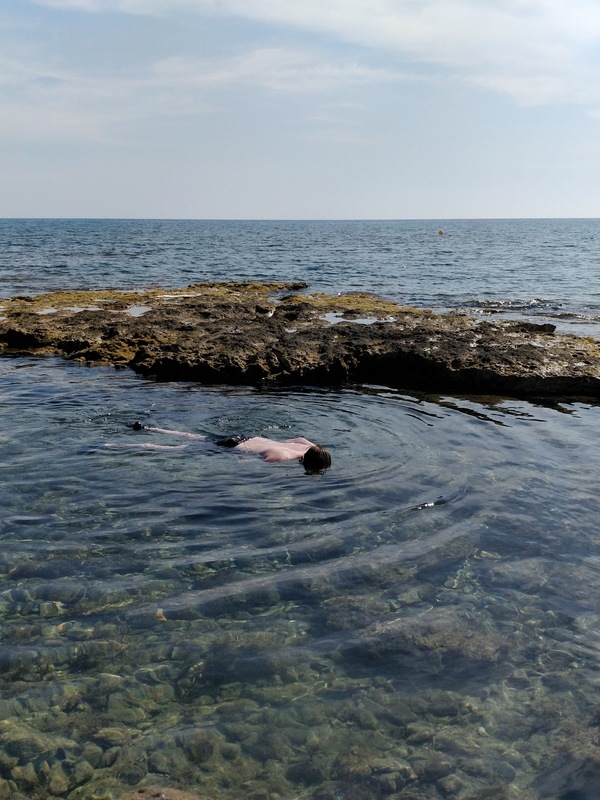 One of my sons decided he would treat me to a relaxing, fun-filled trip to Cyprus, staying with my mum and step-dad who live there. We left my husband in charge of the school run and headed off, just me, my 18-year-old son and his 17-year-old sister, with lots of meals out and beach time planned including some snorkelling using gear chosen from the comprehensive Simply Scuba website. 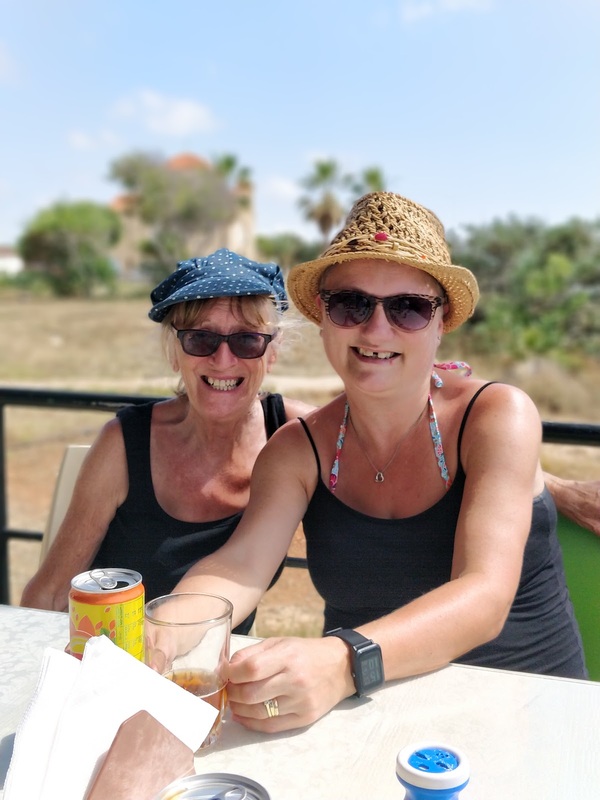 Cyprus is a fantastic holiday destination whatever your age. Young children are treated like royalty and there is plenty on the island to entertain them from beach play to soft play and animal parks. Teens have water parks, go-karts, water sports and (much to my daughter's delight) a slightly lower legal drinking age than the UK. 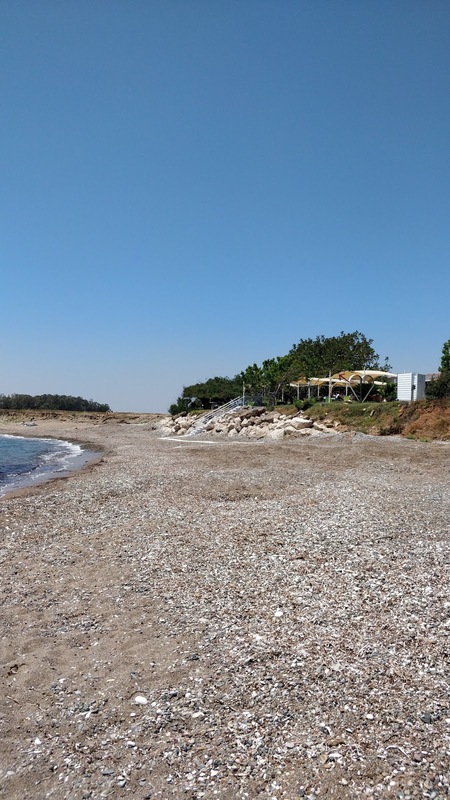 Adults can choose a relaxing break with long, lazy meze and sunbathing or try jeep safaris, scuba and snorkelling adventures, hiking, turtle watching, fishing and much more. 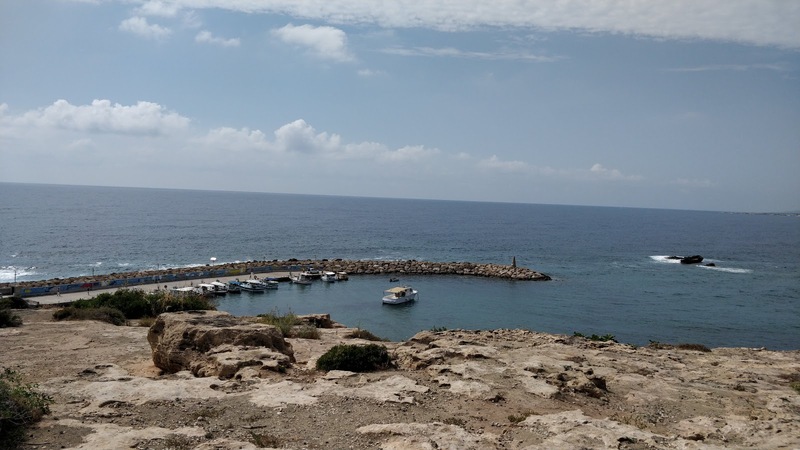 There is of course also much of historical interest on the island including Roman ruins, sea caves and Aphrodite's Rock where the Goddess of Love supposedly stepped from the ocean. I'm not sure I looked much like Aphrodite emerging from the sea in my pink mask and snorkel (chosen from the vast selection on the snorkelling section of Simply Scuba's website) unless the Goddess was having a particularly bad hair day and had eaten one too many of the famous humungous Cypriot pork chops. We like a mix of active fun and lazing around so May is a great time for us to visit Cyprus. You usually get temperatures in the 20's with cooler evenings. Early mornings and late afternoons are cool enough to go for a walk or bike ride, the middle of the day is great for beach time and swimming and the night time is a comfortable temperature to enable sleep. 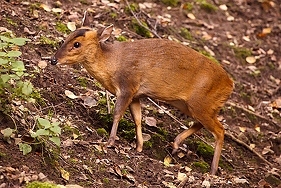 You may have rain but not often for long. I was particularly excited about this trip because we had been gifted some amazing top-quality snorkelling gear from Simply Scuba and after some previous snorkelling fails with cheap gear, I was really looking forward to exploring underwater with some rather more reliable gear which would NOT leave me with eyes and mouth full of seawater. 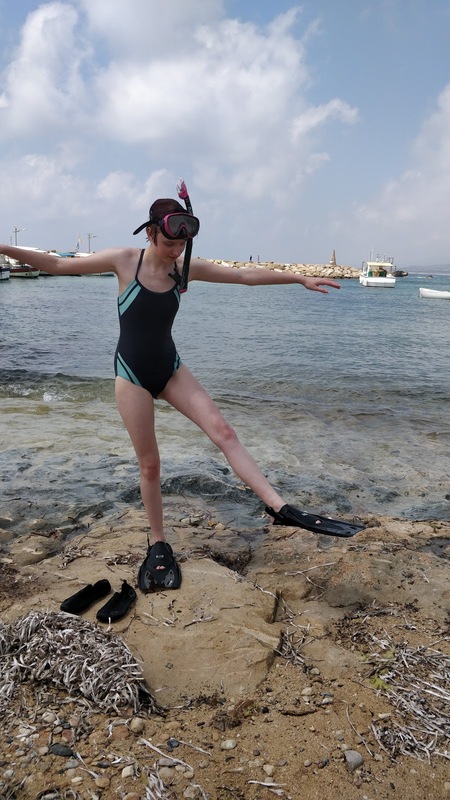 Three sets of snorkelling equipment, including fins chosen to fit our foot size had fitted easily into our luggage and on our first day in Cyprus we couldn't wait to get to the first snorkelling site we had chosen - Agios Georgios near Coral Bay, outside Paphos. The bay is famous for ancient caves in a cliff overlooking the harbour. There's a nice fish restaurant and a gorgeous church at the top and a small sheltered sand and pebble beach with rock pools at the base of the cliffs where there is free parking. In previous visits we have found all sorts of ocean dwellers in the rock pools there ranging from fast moving star fish and sea cucumbers to a fearsome looking spiky creature which looked like an underwater caterpillar. We later discovered this was a fireworm so we are very glad we didn't touch it as it would have been a painful experience. The waves outside the harbour walls were white-topped but inside the water was calm although a little chilly! 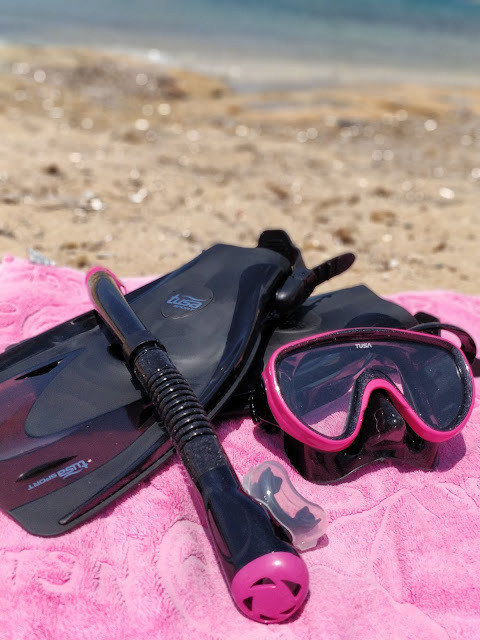 We were relieved to see that unlike our previous "play" sets, the masks and fins from Simply Scuba were incredibly quick and easy to adjust to fit meaning we were in the water within minutes of unpacking our gear. 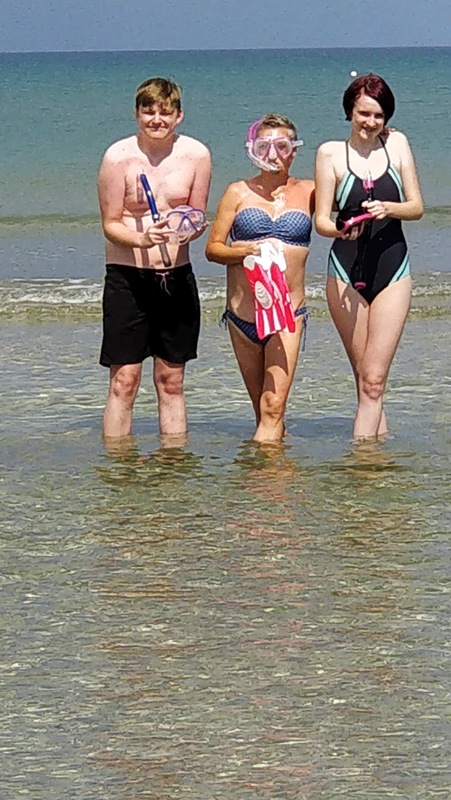 We've never used fins before so that provided other beach-goers with some entertainment as we high stepped in a particularly inelegant way into the water. Once in though the fins made moving much simpler and of course faster when chasing darting fish. 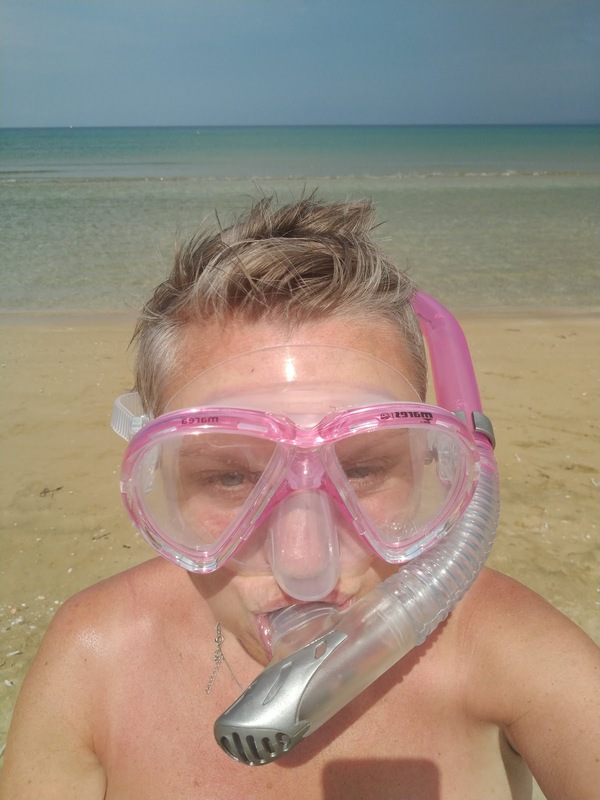 We didn't see much underwater here to be honest so decided to head to a favourite sandy beach where we have previously snorkelled the next day. Ladies Mile near Akrotiri, signposted from Limmasol, is an amazing beach. It is actually more than a mile long despite the name, with a selection of cafes, bars and restaurants along it where you can usually hire sunbeds and brollies. One of the bars even has a massive inflatable assault course thing tethered a few metres out in high season. If you prefer more peace and quiet there is still plenty of deserted beach in between venues where you can park for free, throw down a towel and jump in the sea. You do need a car to get to the beach and do watch out for the very bumpy track across the salt flats where if you are lucky I'm told you can sometimes spot migrating flamingoes. 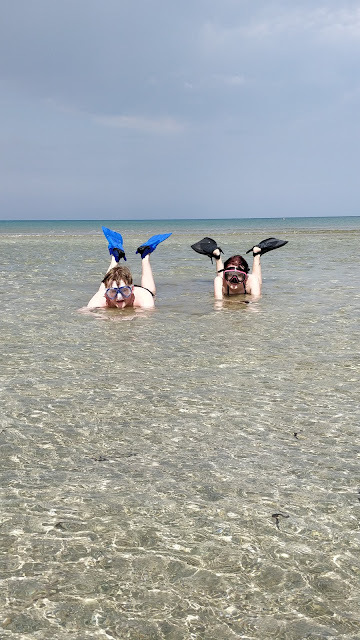 As I mentioned in a previous post, the water at Ladies Mile is very shallow for quite a long way out - check out my short video for a hilarious clip of my two teens crawling on their bellies in full snorkel gear trying to find water deep enough to swim in! You'll also see magic family moments captured during our holiday - from shared cocktails to lizards on a crazy golf course - I'm hoping it gives you a sense of what a great holiday destination the island can be for all ages. Back to Ladies Mile -I quite liked lying on my stomach watching curious little fish come to see what I was doing! 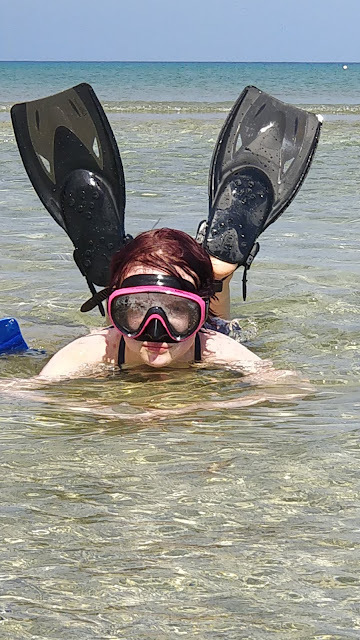 I didn't really need the snorkel doing this but wearing it meant I could keep still with my face under for longer. This is a great place for first time snorkelling and for non-swimmers to join in the snorkelling fun safely too. 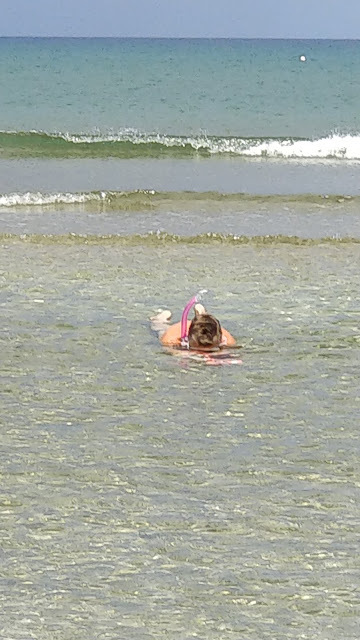 The children went further out then me and spotted lots of fish and hermit crabs scuttling about and spent a happy hour or so in water still shallow enough that they could still put their feet down and stand up if necessary. Our final snorkelling spot was just a mile or so from Paphos airport at Timi Beach. 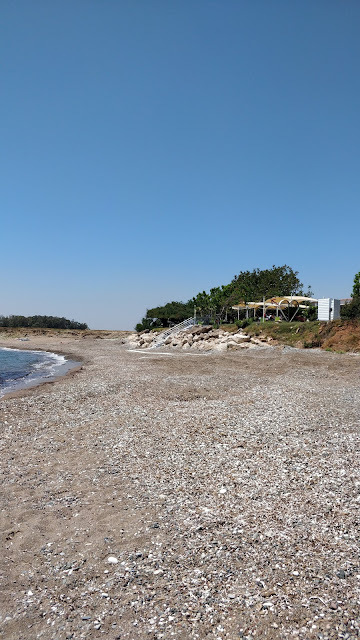 This is a sand and shale beach overlooked by a nice family friendly bar/restaurant where there is free parking, toilets and a beach shower (take one Euro to use the shower). In peak season you can hire beds and brollies. The water here gets deep fast and the ground underwater is rocky so not one for nervous or non-swimmers. There is sometimes a lifeguard as currents can be tricky but we planned to stay close to the shore anyway. Fins or rock-pooling shoes are advised if you want to swim here. However, it is so worth it as just a short distance from the beach it's like being on a reef with all sorts of underwater creatures sheltering in shelves, under rocks and in the plants. We swam in the bay for a while then realised the retreating tide had exposed the large rock pool we found packed with marine life during previous visits. 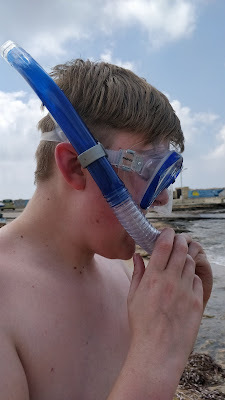 This time we had great snorkel gear enabling us to take a really close look! My sun ditched the snorkel but used mask and fins to manoeuvre around the pool. We saw spotty and stripy fish, a grumpy bottom creeping catfish (who edged closer and closer to my son until he lost his nerve and swam away from the fish), hermit crabs and dozens of shoals of tiny fish - you can see these in my video. 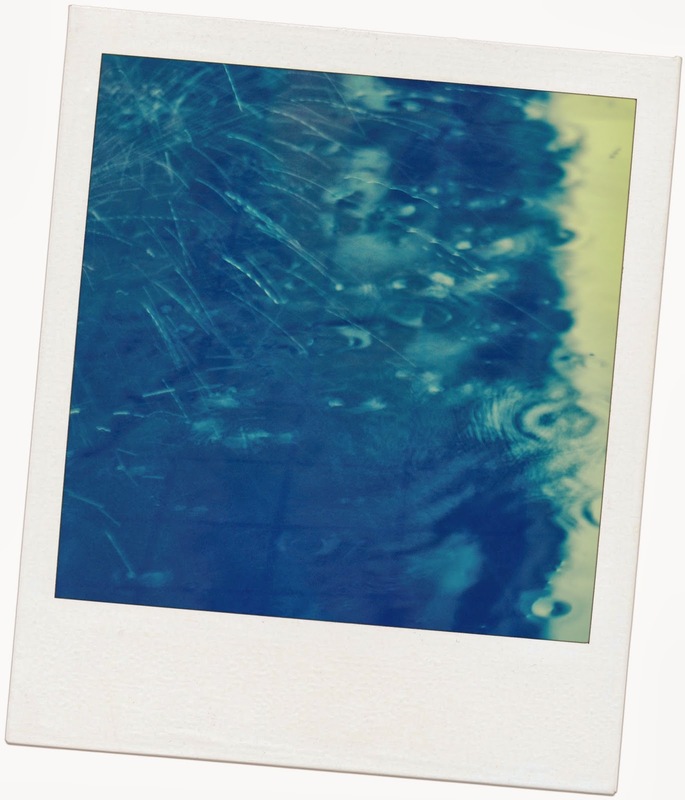 Sadly due to user error our (borrowed) underwater camera failed us so I can't share footage we thought we'd captured. It was great to share these snorkelling adventures with my teenagers and I can't wait to go back with my younger children so they can explore underwater too. I feel so much more confident using the top quality gear from Simply Scuba then cheaper but useless sets from non-specialist stores. 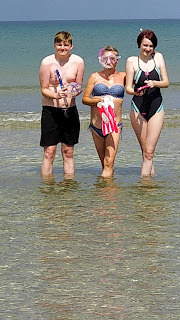 Previous sets bought in chain sports shops and beachfront tat shops have let us down badly after just one or two uses and left me nervous about letting the younger children use masks and snorkels. My confidence has been restored now and I know they would love sets from the children's range available from the website. I can't believe how fast our week away flew by but I'm glad to have lots of memories which will last me a lifetime.